Christmas is fast approaching, which means there are Christmas markets across the region's towns and cities for you to enjoy. If you're travelling with the family, our £10 Family Day Ticket offers great value, covering up to two adults and three children aged under 16. The International Christmas Market takes place at Grey’s Monument, Grey Street and Grainger Street. While the rest of the world are ticking PlayStations and iPhones off their list, you can get back to the cosy feeling of handmade foods and buying special one-off gifts for your family and friends. On weekends until Christmas Eve, a dedicated Christmas market will be running at the city’s popular market spot, giving visitors somewhere new and exciting to pick up gifts and treats. Shoppers can browse stalls offering decorations, handmade gifts, bespoke festive novelties, food, drink, crafts and more – what better way to get into the Christmas spirit? The popular North Shields Victorian Christmas Market will return to Northumberland Square and see stallholders offering a wide variety of goods including festive gifts for loved ones, crafts and food. There will also be entertainment, music and a small fairground for the children. Hadrian’s Tipi is a huge double tipi-style tent at Pilgrim Street, offering continental foods, mulled wines and other drinks amid an inviting setting of log fires and lights designed to recreate the days of Roman Emperor Hadrian’s travels around the region in AD122. As well as the Tipi there is a new stretch tent area with its own 40ft shipping container bar, a street food village featuring North East companies and some German Market Huts with Christmas gift traders. Over the day you can expect some of the most talented makers and creatives in the North East! Artists, jewellers, illustrators, potters, record shops, woodworkers and loads more! It'll be a perfect opportunity to grab some stocking fillers and handcrafted, bespoke gifts. 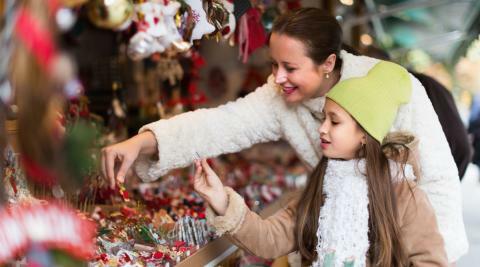 Lots of different unique stalls where you will get some amazing gifts and treats for loved ones this Christmas. With hot food available and a Christmas shopping experience with a difference you don't want to miss it. Like the Newcastle International Christmas Market, this one takes place at Grey’s Monument, Grey Street and Grainger Street, but welcomes stall holders from closer to home. There are beers from local microbreweries, home-made jams, delicious cakes and handmade chocolates. And once you’ve bought something scrumptious to eat, you can find special gifts such as scarves, leather bags, hand-thrown pottery, woolly hats and jewellery. Hexham’s annual Christmas market, with the chance to peruse a huge range of market stalls featuring exclusive handmade crafts and gifts, enjoy a packed programme of music in the Abbey cloister and take in seasonal refreshments including hot chestnuts and mulled wine to keep the mood festive. On Saturday the Farmers’ Market joins the festivities together with a traditional fairground, along with activities for children, from face painting to real reindeer and of course that all important visit to Santa!